Find the the ideal holiday home rental with one of our recommended partners. We only recommend the best and each of our rental property directories offers quality and affordable vacation rentals from Europe's leading self-catering agencies. Belvilla quality European holiday homes. 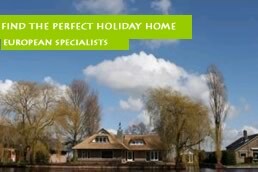 Belvilla holiday homes offer more than 10,000 rental properties throughout 17 European countries. Rental prices are extremely competitive and there is a great range of high quality accommodation to choose from. Belvilla has nearly 30 years of experience (established in 1980) in the European vacation rental business. Search for a holiday home. Interhome offer more than 30 000 rental properties throughout 21 countries.This property rental directory can meet practically any requirement: sea, mountains, town or countryside, in an apartment or villa.There are 1000's of quality rated (star rating system) properties. With more than 40 years of experience in the vacation rental business Interhome is currently the largest provider of quality holiday apartments and villas in Europe. Villarenters directory lists over 10,000 holiday property rentals. Properties reviews by previous renters can be viewed so you can choose holiday homes based on previous visitors experience. Properties are also graded with Villarenters index rating to help you book with confidence.